Completely Barking Mad: A Change of Scene is a Good Thing! A Change of Scene is a Good Thing! So this was my Monday. Tuesday night I stayed at girlfriend's place in Calgary. We were into week 2 of the snow apocalypse. I had decided that should it continue, I would at least be able to make my commute to work in the dim glow of street lamps. If you have never gone into the ditch let me put your mind to rest. It's f$cking scary! On Monday I was attempting to turn around to go home. I knew I was in an untenable position. I shouldn't even have ventured as far as I had in such weather and road conditions. I was only going about 10 km an hour! I was desperately trying to limp home in a storm that had eliminated visibility outside a 1 inch radius around my headlights. I knew I was driving in the middle of the road, because I could hear the bump-bump sound of the raised medium under my tires. The fact that I had no idea where the rest of the road was was absolutely terrifying. You can't see anyone coming, but you know you're in their way. I thought I was close enough to the side of the road to turn around. Obviously, I misjudged. In a scene reminiscent of a sinking ship the car was just sucked into the soft, thick snow until I was so deep physics just stopped it from sliding further. The snow reached up to the passenger side window & when I saw a man - an Angel, really - stop to check on me, I had to shoulder check the door to get it open enough to slip through. I barely got it to close. I was scared if I didn't get it shut I'd run the battery down. Obviously, your brain doesn't work properly in times like these. When your car has become the central core of an snowberg a dead battery is really towards the bottom of the problem list. I scrambled out so quickly to get to my angel's car I left my keys in the ignition. Just imagine how impressed I would have been had someone managed to steal it. That day after AMA had sent the nicest guy to tow we out, I started to cry. It was stress coming out. I hadn't realized how much adenline and emotion had been corsing through my system all day. I literally collapsed into bed at 8 pm, emotionally exhausted. Of course, nothing stopped the snow from blanketing the landscape with another 4 inches over night. 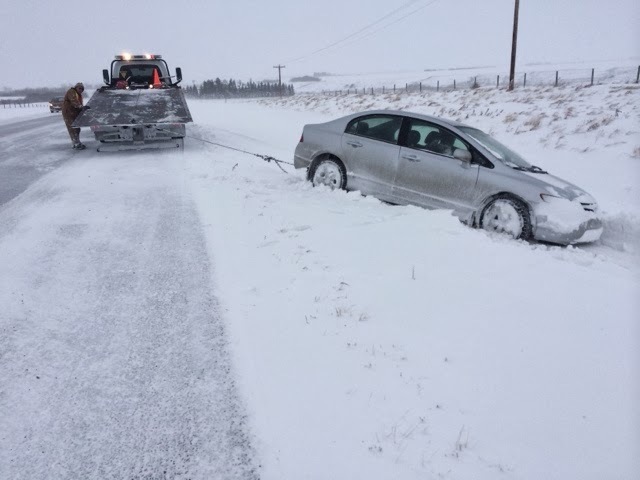 Tuesday morning I barely made it out of my neighborhood before my winter tires caught a bank of snow and propelled the car into another ditch. I couldn't stop the slow sideways slide I was in. I furiously pumped the brakes, but nothing helped. Again, I wasn't going more than about 15km an hour. 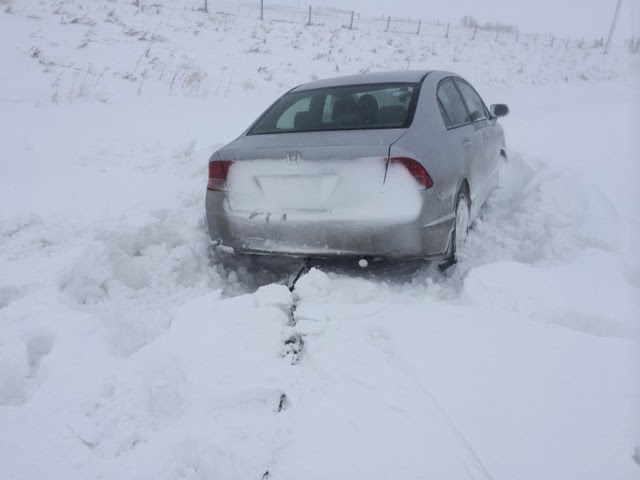 However, this time I wasn't in a ditch on the side of a major highway. I knew I wouldn't be a priority for AMA to pull out. I could be there for days while they fished out all the other chumps like me on the major arteries. So I did what you do in situations like this: you call someone with a truck. Thankfully, my brother-in-law, Brett, lives in our town and possesses a truck. And unlike me, he had wisely called his employer that morning and told them he'd be late. No sense getting on the roads until the sun came up. So he packed up his chains and came to fish me out. Only I was so deep we had to have a lovely Samaritan (who kindly stopped) hook up to his truck to get enough traction to pull me out. One thing I will say for Albertans, they are a hardy, helpful lot. Long story short I eventually made it to work. Took me 2 hours to drive at 40-50kms an hour, but I got there. Finally, on Wednesday the 2 week snow apocalypse stopped. Right now it is +7 in Calgary. I'm sure snow crews are out working furiously to try & clear as much snow as possible, because if there's one thing you can be sure of in winter in Alberta, there is another snow storm around the corner. This is just the calm. This where I got to end my week. 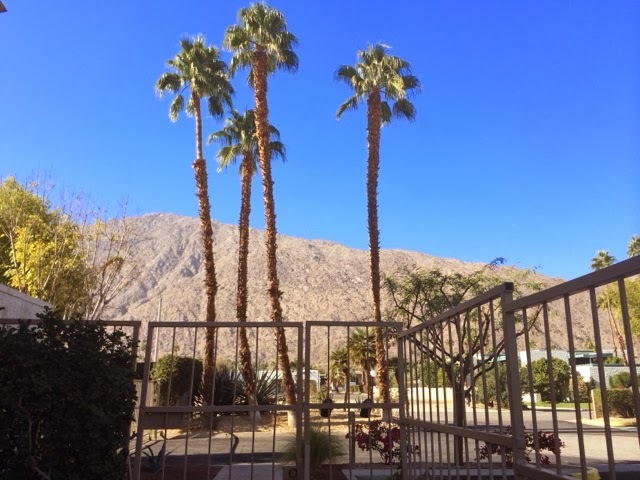 Mark & I flew into Palm Springs this weekend to sign all the paperwork for our condo purchase. We've been running around like crazy, but can't believe how much we have gotten done. I'm currently sitting on the deck soaking up as much sun as my D deficient body can take in. It's amazing how a little change of scenery can make everything better. Posted by Heidi Schempp Fournier at 10:18 a.m.